Covered Porches: 938 sq. ft. Gross Area: 3,581 sq. ft. The Beach House captures all the great features of an Island Home. 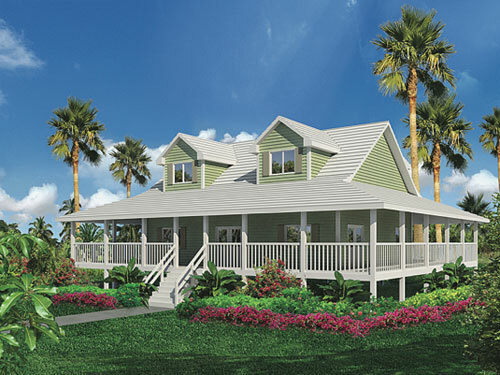 With a foyer entrance and covered porches this model encompasses all the island charms. Measuring 32 x 44ft., the Beach House comprises a 1408 sq.ft. ground floor while the loft offers 820 sq.ft. of living space which is more than ample for a large family with guests. The well appointed, open kitchen provides a feeling of expanse as it flows into the great room. Guests are afforded a master bedroom with en suite bath allows the Owners to live in privacy and comfort. Covered Porches: 1,978 sq. ft. Gross Area: 4,664 sq. ft.